Luxury travel to South Africa must include a trip to the town of Hermanus near Cape Town, and an overnight stay (at least!) at Ocean Eleven Luxury Guest House. 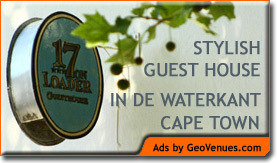 The Ocean Eleven Luxury Guest House is situated on the Cape South coast of South Africa, in the quaint coastal town of Hermanus on Walker Bay. Although the Hermanus village is small, it has a city-like infrastructure and, having been a popular coastal holiday destination for over a hundred years, there are a myriad of things to see and do. Not only does Hermanus offer the best land-based whale viewing in the world, with guests of Ocean Eleven being able to watch these creatures from the comfort of their suite, but our "Champagne Air" is also believed to have restorative qualities and many travel to this coastal town for recuperation and wellness. When visiting Hermanus, a host of adventures await you, from sea kayaking and paragliding to great white shark diving. The Hermanus golf club offers world class golfing and if this is not enough the famous Arabella golf course is but minutes away. The pristine beaches, charming village shops, variety of restaurants, cliff paths and nature reserve, all nestled between an incandescent mountain range and the spectacular Atlantic Ocean; make Hermanus the perfect destination for a coastal holiday. Hermanus is a beautiful 90 minute drive from Cape Town making it an easily accessible short-stay destination and should be included on any travel itinerary to Cape Town or South Africa. Ocean Eleven offers guests luxury accommodation in Hermanus right on the cliff paths overlooking the ocean. Our colonial style luxury guest house exudes the grace and style befitting a destination which has the reputation of being the "Riviera of the South." We look forward to welcoming you as a guest and treating you to a good dose of absolute luxury.